ChiroWay of Duluth Celebrates Clients and a New Award! This last week, ChiroWay of Duluth celebrated Client Appreciation Week! A week full of gratitude, refreshments, treats and giveaways, clients were celebrated all week long. As an added bonus to Client Appreciation Week at ChiroWay of Duluth, the news was shared that they had been named Best Chiropractic Office through the Duluth Tribune! The Duluth Tribune’s Best of the Best Awards is an annual contest that requires the community to vote on which businesses are “the best” in hundreds of categories. 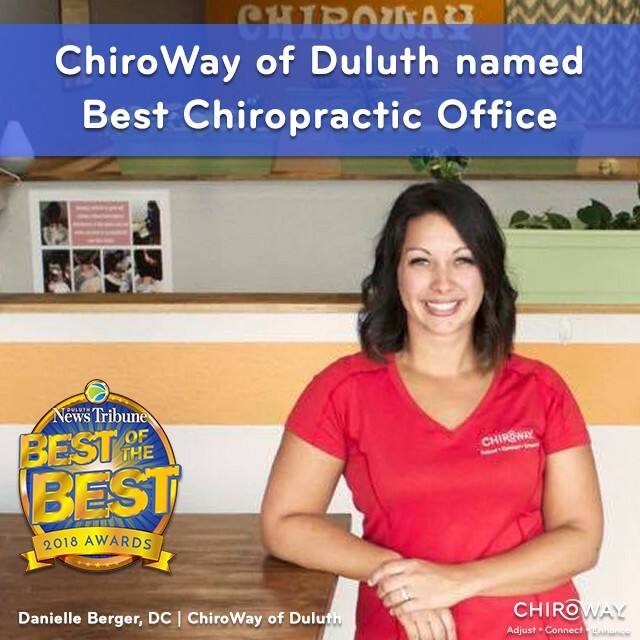 This was the first year ChiroWay of Duluth has been nominated and voted “the Best” Chiropractic Office in the Twin Ports. “It is a huge honor and I feel so proud to have earned it!” Danielle Berger, DC, states. Congratulations to Danielle Berger, DC, for being named the Best Chiropractic Office, and for a successful Client Appreciation Week! ChiroWay provides regular chiropractic care to the community of Duluth in a convenient and affordable membership model. Interested in learning more about our services? Visit ChiroWay.com to check out membership plan details and location specifics for ChiroWay of Duluth.